The foundation stone for a passenger terminal at Ferry Wharf for east coast inland water transport to Nerul, Mandwa and Alibaug will be laid on Monday , and work is expected to be completed by April 2018. But the Maharashtra Maritime Board (MMB) has amended plans for the Ro-Ro service at Ferry Wharf and Mandwa. The shipping ministry , in collaboration with the state government, proposed coastal shipping and passenger transport on Mumbai's east coast. The Ro-Ro passenger transport facilities are to be undertaken by Mumbai Port, MMB and Cidco. Union shipping minster Nitin Gadkari and chief minster Devendra Fadnavis will lay the foundation stone for this and three other projects. The contract has been awarded for providing infrastructure for the Ro-Ro facility at Ferry Wharf by MbPT at a cost of Rs.32 crore.MbPT also plans a terminal building with hotels, restaurants, convention centres and malls. Upgradation of passenger facilities at Ferry Wharf at a cost of Rs.2.10 crore will also begin. The foundation stone will also be laid for a bunkering facility at Jawahar Dweep. 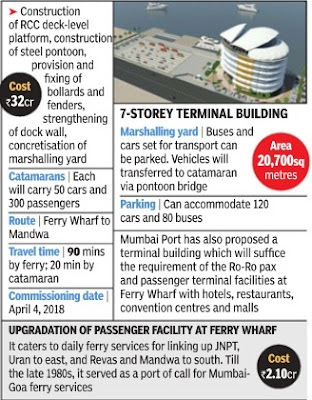 At Ferry Wharf, only two Ro-Ro berths are proposed, against the earlier approved eight catamaran berths and four Ro-Ro berths. MMB has informed the Maharashtra Coastal Zone Management Authority that the development will be contiguous with MbPT facilities. According to the earlier approved plan, the entire terminal area was proposed to be constructed on water, however, as per the revised plan the terminal area will be entirely constructed on land. A 580-metre offshore breakwater has been reduced to 360 metres, reducing the impact on hydrodynamics. The terminal area will be reclaimed land. The proposal was cleared by MCZMA recently and forwarded to the State Environment Impact Assessment Authority with several conditions, such as the mudflats and sand dunes on Mandwa beach will not be reclaimed.